If you’ve read a few of my articles here then it’s obvious I’m pretty loyal to dramatic cable TV shows: Breaking Bad, The Walking Dead, and yes…. Dexter. During the open of Dexter there is a scene where he is cutting and juicing some Moro oranges, known by most as “Blood Oranges”. I never ate a Moro orange before I saw it on Dexter, but when I finally tasted one I knew somehow this was going into one of my beers. 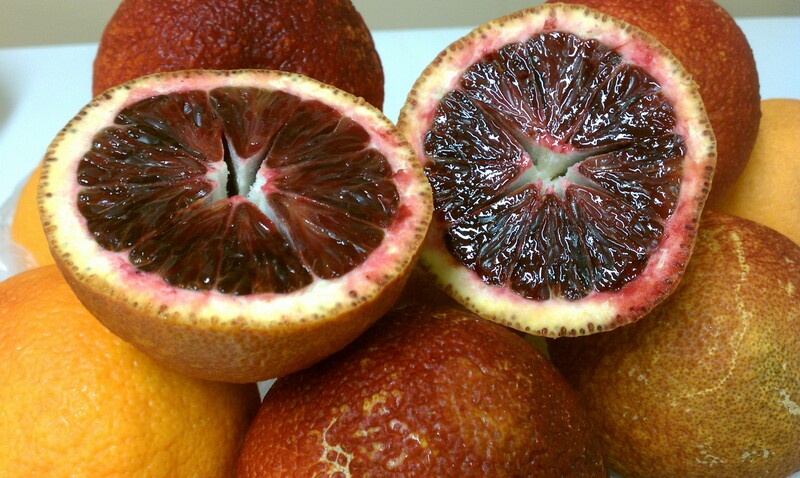 During the 2011 season I had an idea to brew a sour/wild beer using blood oranges, but the blood orange season had already past. 2 weeks ago I saw the oranges were in season and on sale so I bought 25 pounds. 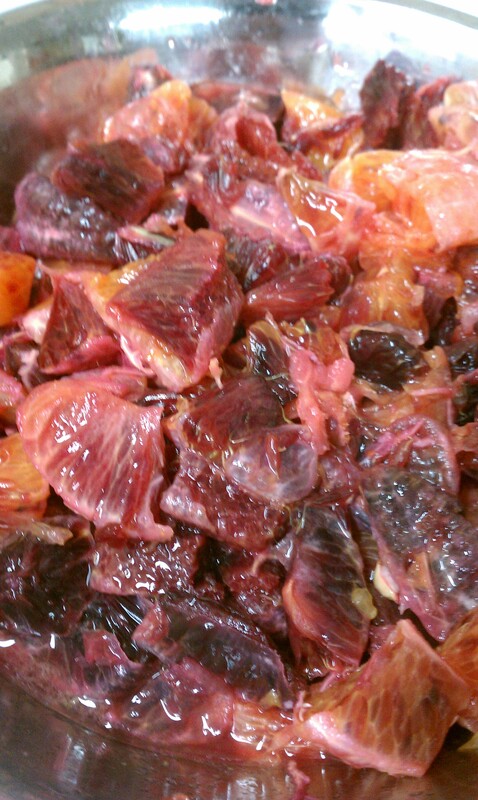 Oh yeah, a blood orange lambic was in my future! On March 14th I brewed a 23 gallon batch to be split 3 different ways. All would use the same base wort, but get varying amounts of blood oranges and fermented 3 different ways but all pitched at 65F. 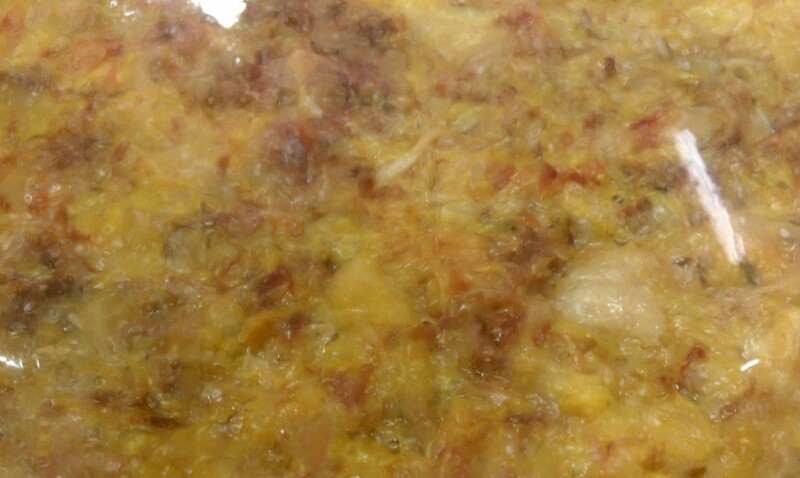 I let the base beer ferment for 5 days before I added the oranges. I peeled, cut up, and smushed the oranges into a size I could easily dump into the carboys. I did crush some of the oranges into a juice. One of the most tedious parts of the orange prep process was removing as much of the “white rind” and stringy bits as I could. I found a cheese grater worked really well after the main skin was peeled for removing the small bits of white rind still stuck on the orange. I was able to get a good amount off the oranges, but knowing I wouldn’t be able to remove it all is one reason the hop IBUs are low in this recipe. The white parts will add some bitterness, so I tried to compensate for the left overs I couldn’t remove. The oranges went into a bowl that had a few ounces of Vodka that I spread around on the oranges. Approximate amounts of peeled cut up oranges 5lbs per carboy, although I think the house funk carboy got about 5.5lbs. 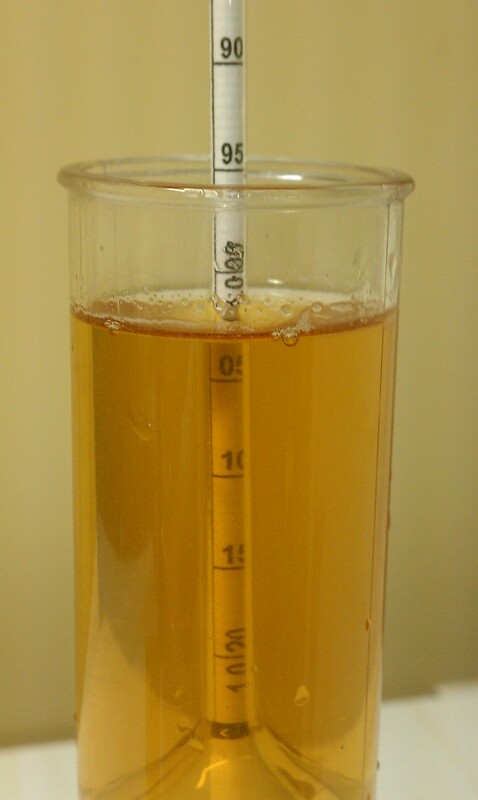 A small amount of orange peel zest was added to each carboy, I’m not sure on the amount though. Call it 2 pinches. 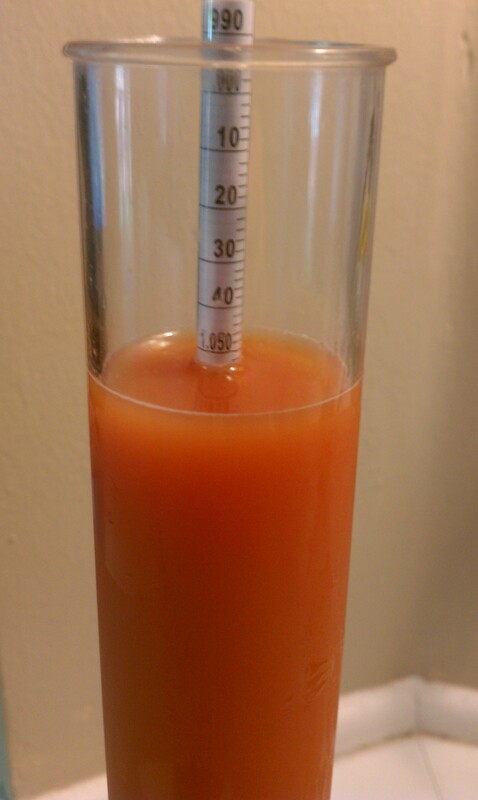 I did get the gravity and ph of the blood oranges but accidentally deleted the ph picture. However I can report the measured ph was 3.6. The gravity of my blood oranges I had came to 1.054. Using a large mouth funnel the juices and pulp poured right into the carboys with only a few pieces needing that extra smash with a spoon. As I was pouring in the oranges I also had a 2 psi stream of co2 going to lessen the chance of oxygen pick up. As of this post the oranges have been in the carboys for almost 5 days. Today I decided to pull samples for gravity readings and tasting. 10 days into this batch and I’m really liking what’s going on. 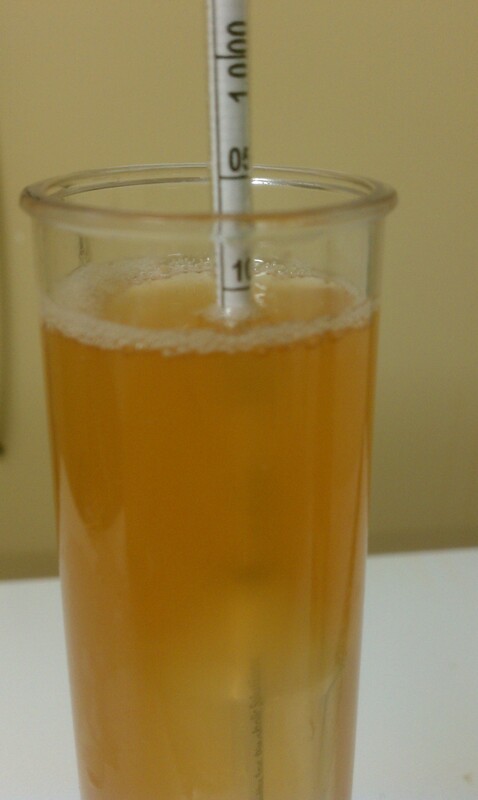 The Brett C+WLP20 version is showing some great playfulness between the yeasts and the oranges. Really complimenting each other very early on. The funky version is showing lactic acid flavors and great orange/grapefruit/raspberry flavors. I do think the beers will darken up and get redder as the oranges break down more and drop out. Right now they are all floating at the top of the carboy. As always I’ll update this post when I get some new info for you, but so far I’m happy with what I am tasting. I did buy a few more pounds of oranges that I’m going to juice then freeze in case I need to add more out of season. The yeasts will determine the beer schedule but right now I’m hoping to serve the Brett version in July. Should be a nice crisp citrus wild treat for the hottest part of the summer and for the new season of Dexter a few weeks later! 5/16/2012 Gravity Reading (Brett C + WLP320) 1.003 . 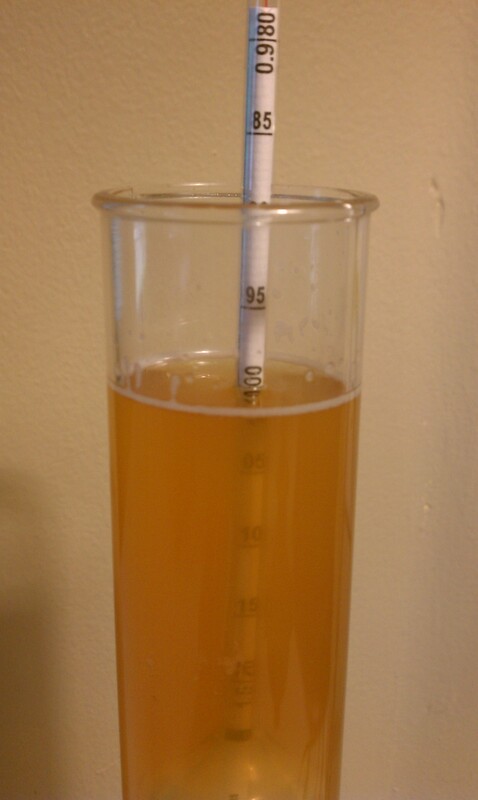 Beer has dropped very clear, the Brett C flavors/aroma are peaking through. 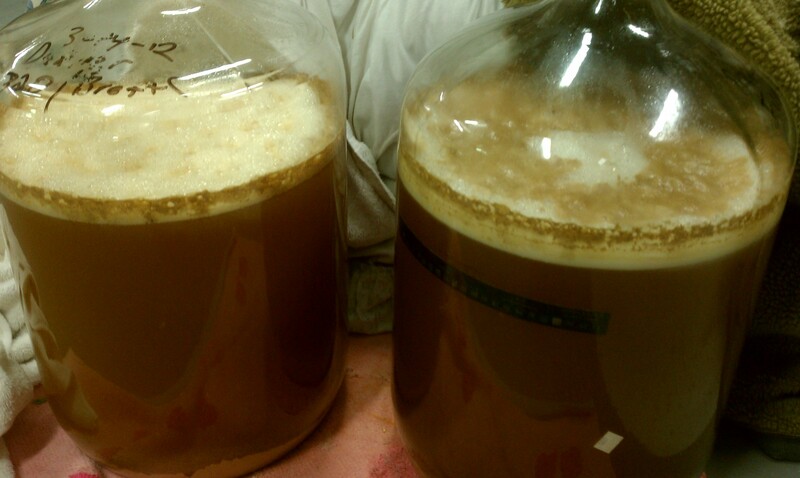 Another month in the carboy should be good. 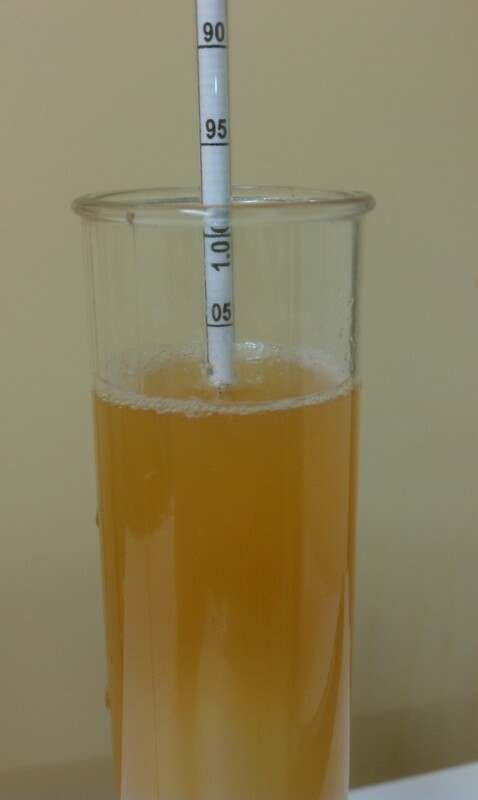 5/16/2012 Gravity Reading (Melting Pot Microbe Blend) 1.006 . Big Lacto and Citric flavors. When finished this beer will not be for wussy mouths. I’ll probably take another reading in July. This version is now bottled up and undergoing carbonation. 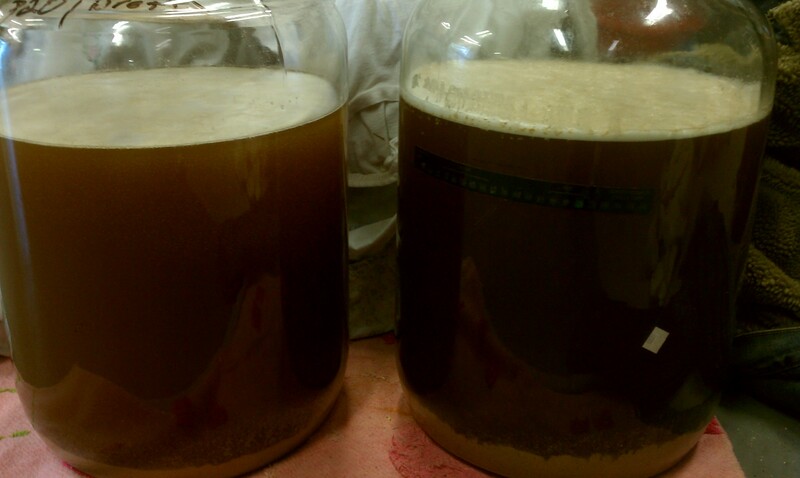 As you can see by the picture this batch fermented all the way out. One last minute change I made to this batch was I decided to dry hop it. I had about 1oz of Citra pellets I needed to use so I tossed them in at 70F and let them sit for 10 days. The aroma on this beer at bottling is huge pineapple and oranges. I can’t wait to start sharing bottles of this version. Looks like some promising brew. Can’t wait to hear how it tastes! I dig the TV show inspiration too. I tend to come up with brew names and ideas from songs and movies. One of my favorite brews to make is my “P. Worrells Miak Stout”. A blend of a great milk stout recipe with my childhood love of the Ernest goes to…. movies. Cheers! Ha! Ernest P! I admit I saw a couple of those movies at the theater! Interesting brew. Can’t wait to hear how it turns out. I dig the TV show inspiration too. I get a lot of my brew ideas/names from songs and movies. One of my favorite brews to make is my “P. Worrells Miak Stout.” It’s a blend of my childhood love of the Ernest movies with my milk stout recipe. Cheers! Why not just juice the oranges? That way you’ll be able to add a specific volume of juice instead of a unknown amount of it. Just a thought. Funny story about that…well probably not really funny, but to a dad it is…. My original plan was to coarse juice most of it and still have some chunks cut up to put in, but I couldn’t find our juicer. Its one of the small plastic ones. I actually found it over the weekend. My daughter had taken it out of the drawer and put it in her Fisher Price play kitchen! On the amounts though, They were weighed out, maybe an ounce or so different but nothing I feel like will make any difference. I did have some juice that poured right in. I do want a real electric juicer though. I have a young daughter, so that story was, indeed, funny. I’m curious why you chose to add the fruit so soon after initially pitching. I thought that fruit additions in lambics, to make kriek frambiose etc. were often after a prolonged period of aging of the initial lambic? Do you think your orange character will show through after aging and are you planning a later on fruit addition to combat this? You are exactly right. Most great fruit lambic producers will let the base lambic go for year(s) then add the fruit/flowers etc… On my Kriek and Framboise the fruit doesn’t get added for a couple years into the ferment. This one I felt like it was a bit different so my plan is to see how this turns out as one that can be turned in a shorter amount of time. My melting pot bug blend is a crazy fast fermenter that produces alot of lactic. That combined with the citric acid in the oranges I was thinking (hoping) that it would turn by July. I could be completely off base, but I thought it was worth a shot. 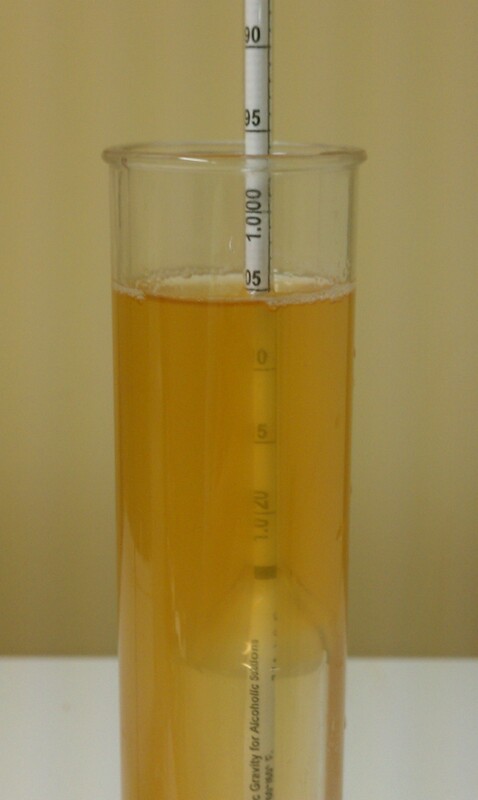 The one with the WLP300 is now kegged and tastes great, I can taste a bit of the aciduated malt in it which goes great with the oranges. So Brandon — how did it taste (by version)? My wife is a huge fan of blood oranges and she digs a nice lambic from time to time; this could be a perfect 2014 project for me. Myself and others thought it turned out really nice. It’s been one of my most asked for beers. I’d suggest doing it, I messed up this year and missed blood orange season so I’ll have to wait until next year to brew it again. Could you use a can of blood orange puree? Or would it work better with the raw fruit?